Promis/Inslaw scandal. 241 Marines killed in Lebanon by a suicide bomber. US invades Grenada, overthrows government, and installs US-friendly regime. Reagan envoy Donald Rumsfeld meets with Hussein to shore up US-Iraqi relations. October 25: The US launches "Operation Urgent Fury," an invasion of the tiny Caribbean island nation of Grenada. Ostensibly an attempt to protect US students and tourists during civil unrest in that country, the real reason for the invasion is to overthrow the newly installed Marxist government, mostly for fear that Grenada will begin supporting Cuba and the Nicaraguan Sandinistas. (One of the main concerns cited by the US is the building of a "military" airstrip by Cuban engineers; the airstrip was later proven to be what it was always claimed by Grenada, a commercial airstrip built to support Grenada's tourist industry. The main contractor for the airstrip was Plessey, a British firm, which supplied information showing that the airstrip could not have been used for military purposes. The US later helps complete the airstrip.) The Grenadan invasion also serves to direct attention away from the disastrous October 23 bombing of a Marine base in Lebanon, which killed 241 Marines, though the decision to invade Grenada was made well before the bombing and one source says Reagan actually hesitated to approve the invasion after the bombing. Another pretext for the invasion is a supposed request by the Organization of Eastern Caribbean States; while such a request was indeed made, it was only made at the US's behest, and the actual request was drafted by Reagan administration officials, which was given to selected conservative Caribbean leaders to sign. Many OECS members opposed the invasion. Reagan insists that Fidel Castro's Cuba is behind the coup, though in reality, Castro opposed the coup. However, when US intervention becomes apparent, Castro tells the Cuban engineers and troops on the island to stand with the Grenadan military in resisting the US incursion. 1,200 US troops invade the island on October 25, and meet stiff resistance from Grenadan and Cuban forces; though US reports state that the resistance was largely Cuban, the reality is that less than 100 of the 700 Cubans on the island were soldiers, and the resistance the US faced was almost completely from Grenadan forces. Over the next few days, the US forces increase to around 7,000, more than enough to rout the Grenadan and Cuban resistance; heavy fighting lasts only two days. US troops reportedly find a cache of weapons that could arm 10,000 men, including automatic rifles, machine guns, rocket launchers, antiaircraft guns, howitzers, cannon, armored vehicles and coastal patrol boats; in reality, the forces find three warehouses less than a quarter full of antiquated small arms that had been confiscated days before from local militias. 19 US troops are killed in the fighting, while over 100 Grenadan and Cuban troops are killed. By December, US troops return home and a US-friendly government has been forcibly installed. US media coverage of the invasion is strictly censored and controlled by the Pentagon, which quarantined reporters on Barbados during the first days of the invasion, and as a result, coverage in the US is extremely friendly; one correspondant labels the invasion "a lovely little war." The invasion and overthrow of Grenada's government is the first example of military-enforced "regime change" in recent US history. One of the most memorable photos from the invasion is the shot of a US medical student kissing the ground as he disembarks from a plane bringing him and fellow students from Grenada to an American military base; what is not widely reported is that the students had every opportunity to leave the country before the US invasion (Reagan will falsely claim that Grenada had shut down its airport, making flight impossible), and that the 800 medical students were left in Grenada as part of a US justification for the invasion instead of airlifting them out beforehand. The students were never in any danger from either US or Grenadan/Cuban forces. An FPIF report states, "Apparently, by limiting the ability of Americans who wished to depart from leaving, the Reagan administration could then use their continued presence on the troubled island as an excuse to invade. The Reagan administration admitted that no significant non-military means of evacuating Americans was actively considered." 500 parents of the students contacted the White House asking that no "precipitous action" be taken; Grenadan and Cuban officials met with medical school officials days before the invasion and guaranteed the safety of the students, a promise they kept. 90% of the students told Chancellor Charles Modica that they did not want to be evacuated. During the invasion, Modica criticizes the invasion and says that the military intervention posed a far more severe threat to the students than any faced before the incursion. Many students chose not to leave the island even during and after the invasion; while students who left were "debriefed" and their statements of support for the invasion were made public, the students who remained behind, who largely denounced the invasion, were never featured in US press coverage. It took three days for American troops to "secure" the entire medical school campus. The FPIF report asks, "Why, then, did the United States invade? Many believe that Grenada was seen as a bad example for other poor Caribbean states. Its foreign policy was not subservient to the American government and it was not open to having its economy dominated by US corporate interests. A show of force would cause states with similar leftist nationalist ideals to think twice. If a country as small and poor as Grenada could have continued its rapid rate of development under a socialist model, it would set a bad precedent for other Third World countries. In short, Grenada under [Bishop's] New Jewel Movement was reaching a dangerous level of health care, literacy, housing, participatory democracy, and economic independence. Of particular concern was the influence Bishop and his supporters -- who were greatly inspired by the Black Power movement in the United States -- could have on African-Americans. A successful socialist experiment by English-speaking Blacks just a few hours by plane from the United States was seen as a threat. "This invasion was also an easy victory for the United States eight years after its defeat in the Vietnam War and just two days after the deadly attack against US forces in Lebanon. It established the precedent for 'regime change' by US military intervention and served as an ominous warning to the leftist Sandinista government in Nicaragua that the Reagan administration could go beyond simply arming a proxy army like the Contras and actually invade their country outright. It also led to a sudden rise in President Reagan's popularity, according to public opinion polls. Despite the fact that the invasion was a clear violation of international law, there was widespread bipartisan support for the invasion, including such Democratic Party leaders as Walter Mondale, who would be Reagan's Democratic challenger for the presidency the following year. (In his successful challenge of incumbent Connecticut Senator Lowell Weiker that year, Democratic Senate nominee and future vice-presidential candidate Joseph Lieberman attacked his moderate Republican opponent for having raised Constitutional objections to the invasion of Grenada.)" The invasion receives bipartisan support from Congress and overwhelming support from the US citizenry. World reaction to the invasion is overwhelmingly negative, though this receives little play in the American media. A UN Security Council vote to condemn the invasion is thwarted by the US, which casts the sole opposing vote. FPIF reports, "The invasion could not have been better timed. The Grenadan people were so embittered and divided by the [Coard] coup and subsequent killings that resistance was only a fraction of what it could have been had the invasion come two weeks earlier. Similarly, opposition in the United States, which could have pointed to a progressive and popular Grenadan government under Bishop, had to acknowledge that the successor regime was brutal, unpopular, and illegitimate. Public attention was focused on the bombing of the Marine barracks in Beirut, Lebanon a few days earlier that had killed 242 servicemen, so popular sympathy and support for the armed forces was unusually high. In Grenada during the ensuing months, the mass organizations were dismantled, the labor unions were re-organized, over half of all medical personnel were expelled, investment and tax codes were revised to favor foreign [primarily US] investment, and cooperatives and states enterprises were sold to private interests. Billboards that had inspired the population to work for justice, equality, development, and national sovereignty were quickly replaced by those designed to inspire them to buy American consumer products. The quality of life for most islanders deteriorated in the period following the invasion despite infusions of American aid. This was most apparent in the health care field, where not a single pediatrician remained in this country where 60% of the population was under 25, nor was there a single psychiatrist to care for 180 mental patients. (Seventeen patients and one staff member were killed when the U.S. bombed the mental hospital during the invasion.) The US invasion of Grenada prompted witch-hunts throughout the Caribbean for those with leftist sympathies. Countries that thought they had the right as sovereign nations to receive economic and military assistance from whomever they pleased realized they had to reconsider. The day after the invasion, for example, Suriname closed down the Cuban embassy in its capital and expelled its diplomats. Upon taking over the island, most foreign doctors, teachers, and other civilians were summarily arrested and expelled by US officials. Shortly after the invasion, US forces raided and ransacked the Pope Paul Ecumenical Center due to its supposedly 'subversive activities' of aiding the poor. Hundreds of Grenadans were held for months without charge. Some suspects were shackled and blindfolded in violation of Hague Convention standards on the treatment of prisoners of war. The island's only radio station was taken over by the US Navy. The right of free assembly was seriously curtailed, the press was censored, and writ of habeus corpus was abolished. Over the next several years, US forces loosened their grip and allowed for popular elections. Grenada has joined other small Caribbean islands under the leadership of a conservative and corrupt elite. The current center-right government, for example, has engaged in some major irregularities in awarding contracts for public works projects to foreign investors with criminal ties and has set up offshore banking operations with little oversight. Although Grenada's economy has been expanding, poverty is widespread, and it appears that the country has little choice but to follow the neoliberal orthodoxy dictated by Washington and its allied international financial institutions." December 19 - 20: Reagan sends a special envoy, former Defense Secretary Donald Rumsfeld, to Iraq with a handwritten letter for Saddam Hussein asking for the resumption of diplomatic relations. Rumsfeld tells him that to ensure US support, he has to keep his nose clean in the court of world opinion. Rumsfeld says to the New York Times, "[Hussein] made it clear that Iraq was not interested in making mischief in the world. ...It struck us as useful to have a relationship, given that we were interested in solving the Mideast problems." He says that Iraq isn't interested in becoming a threat to anyone else. Rumsfeld says at the time that he warned Hussein about using chemical weapons; that assertion has later been proven to be a lie, though he did mention the issue in a later meeting with other Iraqi officials. What he doesn't say is that the Reagan administration has come to a secret decision to back Hussein; he tells Hussein that the administration views "any major reversal of Iraq's fortunes as a strategic defeat for the West." 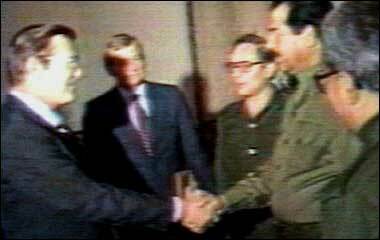 Donald Rumsfeld and Saddam Hussein shaking hands, December 19, 1983. Rumsfeld is instrumental in providing Hussein with US-manufactured chemical and biological weapons.